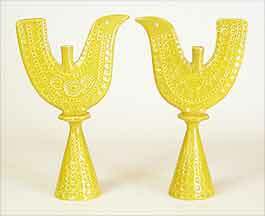 Arklow candle holders - 8⅛" (206 mm) high. This pottery was established at South Quay, Arklow, Co. Wicklow in the Republic of Ireland in 1934. The company, which produced earthenware goods for table and decoration, grew to be a major employer. It was taken over towards the end of the twentieth century by the Japanese company, Noritake. The company ran into financial difficulties and liquidators were called in in August 1998. Production ceased in April 1999.